We've had a snow day and an early dismissal in the last week due to "snow." I quote snow because as someone who grew up outside of Rochester, NY and lived, worked and went to grad school in Buffalo, I do know a bit about snow. This stuff in Virginia ain't it! In celebration of seeing a bit of the white stuff, my son and I have been reading books about the science of snow--how it forms, it's shapes, symmetry, etc. I'm focused on hexagons and the number six. If I were insanely creative, I'd invent a poetry form related to snow crystals, but alas, I've tried and come up with nothing. So instead, let's write about snow. Leave me a note about your poem and I'll share the results in time for Poetry Friday. In the last week we've had a snow day and an early dismissal for snow. It's only been a few inches, but it has been most welcomed by the kids around me. 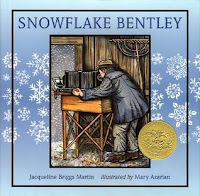 In anticipation of and celebration of snow, we've been reading a few of our favorite books on the subject. 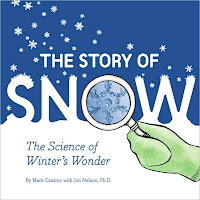 The Story of Snow: The Science of Winter's Wonder, written by Mark Cassino with Jon Nelson - Mark Cassino is a fine art and natural history photographer. Jon Nelson is a teacher and physicist who studies ice crystals and clouds. Together they have given us a stunning volume on the formation of snow. A perfect mixture of art and science, Cassino's photographs are accompanied by clearly written text that explains a very complex process in terms kids will understand. 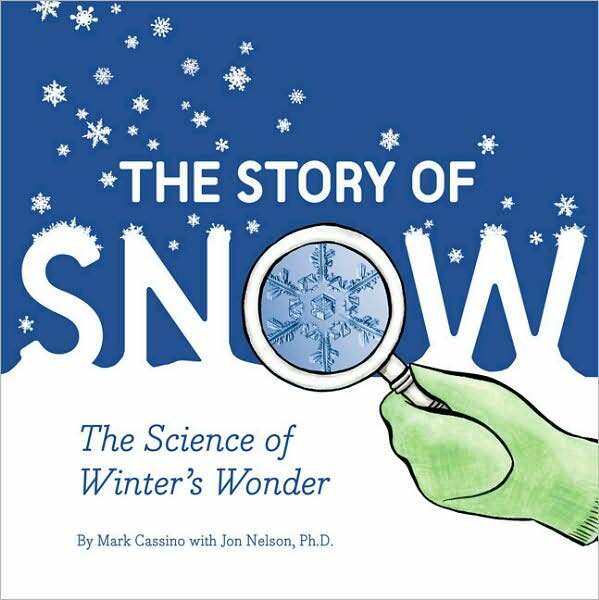 Readers will learn what snow is made from, how it forms, what shapes it takes, and more! 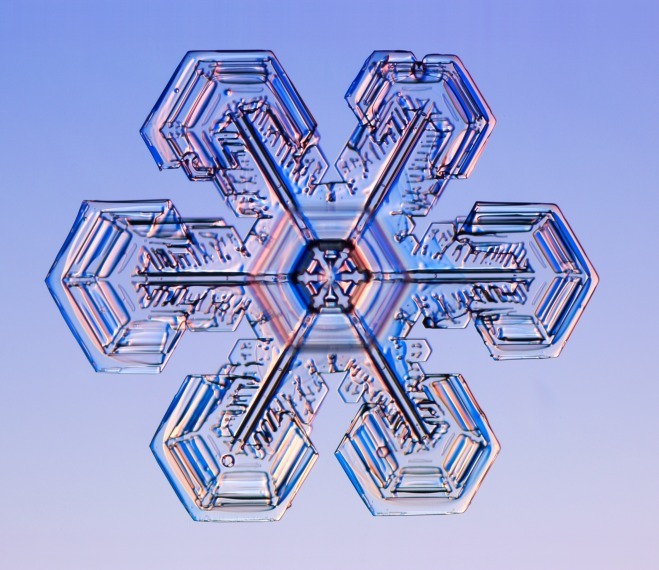 Photos of snow crystals are included with a comparison of the enlarged images to a snow crystal of actual size. In the back matter you will find directions on how to catch snow crystals and examine them. For more ideas for extending the text, download a teacher's guide for this title at the Chronicle web site. 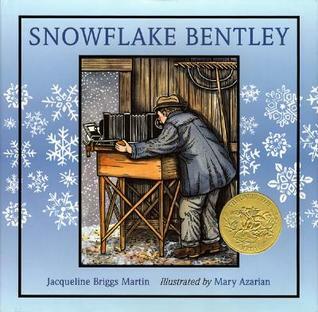 Snowflake Bentley, written by Jacqueline Briggs Martin and illustrated by Mary Azarian - This Caldecott Medal winner tells the true story of Wilson Bentley, a farmer who spent the better part of his life studying and photographing snowflakes. It begins this way. The Secret Life of a Snowflake: An Up Close Look at the Art and Science of Snowflakes, written by Kenneth Libbrecht - The author of this book is a physicist at Caltech known for his passion for snow crystals. 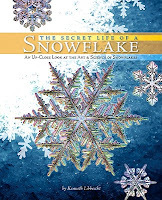 In this book aimed at 9-12 year olds, but appropriate for a much broader (and older) audience, Libbrecht teaches readers what snow crystals and snowflakes are, where they come from, and how these amazing structures are created out of thin air. His own photographs beautifully complement the text. 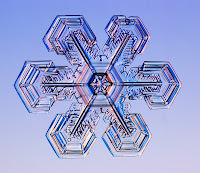 All snowflakes begin with water vapor in air, but as they begin their journey toward the ground, changes in temperature and humidity determine their exact and unique shape. Libbrecht answers questions that many children (and adults) are apt to ask, such as "Why is snow white when the crystals that comprise snow are clear?" Libbrecht's web site, SnowCyrstals.com, provides a wealth of images and even more information for those readers who finish the book and want to learn more. I recommend starting with the Snowflake Primer and the Snow Crystal FAQs. 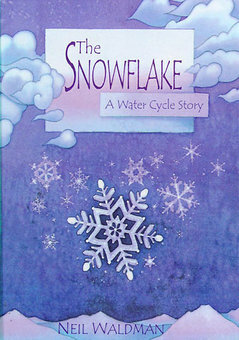 The Snowflake: A Water Cycle Story, written by Neil Waldman - While ostensibly not a book about snowflakes, this water cycle book does begin and end with a snowflake. I like this book because it makes understandable the idea that resources on Earth are finite. Kids have a hard time with this notion, but Waldman makes this message clear as readers learn that the water we drink, wash in, and play in is part of an amazing cycle that repeats itself over and over and over again. Water takes many different forms, but it's the form of snow in which this journey begins. In January a snowflake lands on the peak of a mountain. Over the course of year the snowflake changes both location and form. In February it's blown into a mountain pond, where it melts in March. This tiny droplet sinks into an underground stream where it continues its journey. That water drop travels to a farm and evaporates into the clouds before it comes back down to the ground to travel even further. Eventually it becomes a snowflake once more. This post was written for Nonfiction Monday. The round up is being hosted by Laura Salas. Do stop by and check out all the wonderful books being shared today. I looked at the calendar late last week and realized I missed Monday's poetry stretch and a whole host of other things I meant to do. As I work back into book reviews, I have posted a new thematic list on the 100th day of school over at my teaching blog, Bookish Ways in Math and Science. For some ideas on books to read and activities to try, check out the post 100th Day Books and Ideas. Today is the first day of the spring semester. As I wonder what this term will bring, I've started thinking a lot about firsts--first day of school, first kiss, first time on a plane, first time jumping out of one, etc. I've had a lot of firsts in my life, so this seems like a fine time to write about them. What first do you remember fondly? Or with great horror? Let's write about firsts. Hello All! Remember me? It's been five weeks. Where did the time go? I'll admit that I checked out with the end of semester work and holidays. I am back at work now and happily ensconced in the work of getting ready for a new semester. I did a lot of reading and reviewing over the break. One of the books I read was Marilyn Singer's A STRANGE PLACE TO CALL HOME. The poet in me loved the use of varied forms (free verse, triolet, villanelle, terza rima and more), while the scientist in me was thrilled with a text that introduced readers to oddities in the natural world. Here's an excerpt from one of my favorite poems. chimneys built on the ocean floor. in tubes that shield them from the heat. Since reading this I've been thinking a lot about the places where we live. A recent trip to Manhattan had me thinking about living in cities and teeny tiny apartments that cost outrageous amounts of money, but I digress. Let's write about homes, habitats, or other places humans or animals might live. Leave me a note about your poem and I'll share the results in time for Poetry Friday.